Want to enjoy the beach atmosphere but can’t get to the west coast of India? Mahabalipuram (or Mammallapuram as it's otherwise called) is perhaps the most popular beach on India's east coast. It's got a thriving backpacker scene but is also frequented by tourists who go to relax at the resorts there. Approximately 50 kilometers (31 miles) south of Chennai in the state of Tamil Nadu. It's 95 kilometers (59 miles) north of Pondicherry. Mahabalipuram is about 1.5 hours drive from Chennai, along the East Coast Road. It's possible to take a local bus, taxi, or auto rickshaw there. Expect to pay around 2,000-2,500 rupees in a taxi compared to 30 rupees by bus. The nearest railway station to Mahabalipuram is at Chengalpattu (Chingleput), 29 kilometers (18 miles) northwest. 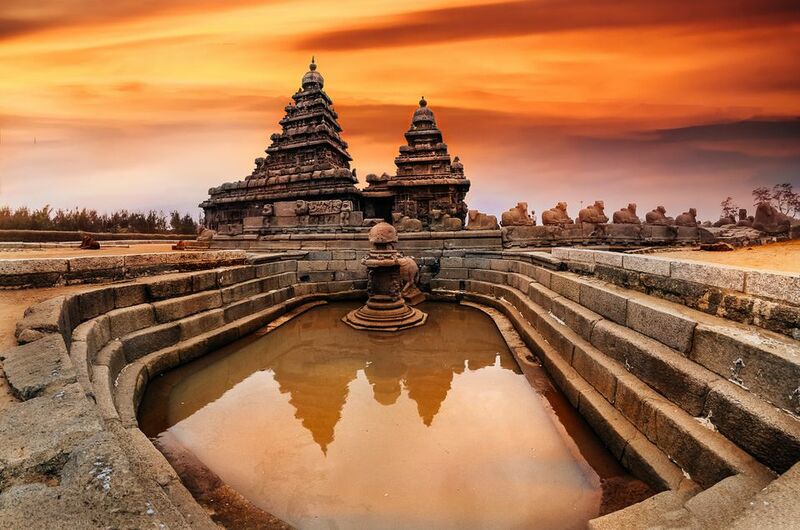 Tamil Nadu Tourism runs an inexpensive one-day bus tour from Chennai to Mahabalipuram. Numerous travel companies also offer private tours. A Hop On Hop Off Bus used to operate between Chennai and Mahabalipuram. However, the service stopped in 2013 due to lack of patronage. Mahabalipuram has a hot and humid climate, with summer temperatures in late May and early June often reaching 38 degrees Celsius (100 degrees Fahrenheit). The town receives most of its rainfall during the northeast monsoon season, from mid-September to mid-December, and heavy rains can be a problem. The temperature decreases to an average of 25 degrees Celsius (75 Fahrenheit) during winter, from November to February, but doesn't drop below 20 degrees Celsius (68 Fahrenheit). The best time to visit is from December until March when it's dry and cool. The beach itself isn’t particularly special, but the town is full of interesting temples, including the windswept Shore Temple right on the water’s edge. This temple, which dates back to the 8th century, is considered to be the oldest significant standalone stone temple in Tamil Nadu. Mahabalipuram is also known for its stone sculpture industry (yes, you can buy them!) and rock-cut monuments. Two of the main attractions are the Five Rathas (sculptured temples in the shape of chariots, carved from single large rocks) and Arjuna's Penance (a huge carving on the face of a rock depicting scenes from The Mahabharata). Most carvings were done in the 7th century during the reign of the Pallava kings. Entry tickets to the UNESCO World Heritage group of monuments at Mahabalipuram (which includes the Shore Temple and Five Rathas) cost around 500 rupees ($7) for foreigners and around 30 rupees ($0.43) for Indians. The hill on the west side of town is worth exploring as well. It's open from sunrise until sunset and has diverse attractions including a huge precariously-balanced boulder called Krishna's Butterball, some exquisitely carved monuments, temples, and a lighthouse. If you're feeling energetic, take a Village Bicycle Tour to nearby Kadambai Village to experience rural living. The village is notably plastic-free. Mahabalipuram is one of the best places to surf and get lessons in India. June and July produce perfect waves, and they last quite well until the end of September. After that, they fall flat in October and November. The Mamallapuram Dance Festival is held during late December to late January at Arjuna's Penance. To get around, hire a bicycle or a motorbike. It's also possible to walk, as Mahabalipuram is not a large town. If you really want to relax and unwind, choose from the many natural therapies on offer around town. Mahabalipuram doesn't have a wide range of hotels but there are options to suit all budgets from inexpensive to luxury. The beach resorts are generally located to the north of the town center, where the beach is better. However, if you want to stay closer to the action, you'll find a number of inexpensive places in town. Travelers make a beeline to the lively backpacker district around Othavadai and Othavadai Cross streets, which lead down to the beach near the Shore Temple. The Fishermen's Colony fronting the beach also has some cheap accommodations. Another popular area is East Raja Street, the town's main street. There's a plethora of cafes and restaurants on Othavadai and Othavadai Cross streets. Instant Karma is one of the better ones. Moonrakers has been in business since 1994 and is iconic. Try the family-run, airy rooftop Gecko Cafe for a beer and seafood. Le Yogi has delicious seafood too. Babu's Cafe is surrounded by trees and attracts travelers from all over the world. Sea Shore Garden Restaurant has beach views (and English celebrity chef Rick Stein once said he had the best fish curry in India there). Go to Freshly n Hot Cafe, next to Silver Moon Guesthouse, for great coffee. As always in India, there are scams you should be aware of. Where there are temples there are so-called guides offering to share their knowledge for a high fee. The ocean at Mahabalipuram can have particularly strong currents, so care should be taken if swimming. This is particularly the case to the right of the Shore Temple.